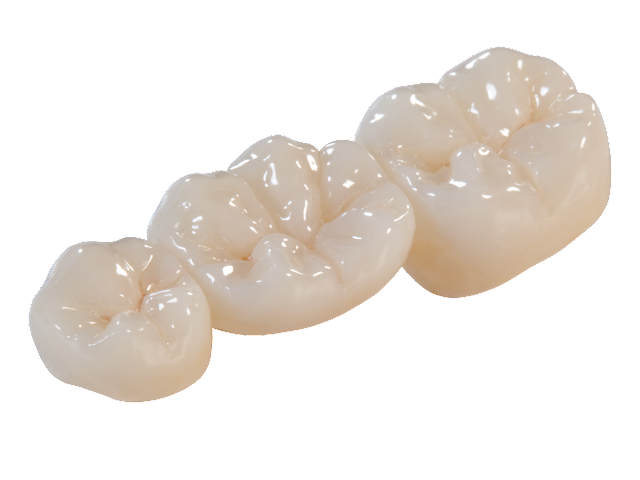 BruxZir solid zirconia is a monolithic zirconia crown, bridge with no porcelain overlay. The material was originally intended to provide a durable, more esthetic alternative to PFM restoration for demanding situations where high strength is must, like people with strong jaws, bruxzers and areas with limited occlusal space. Now, with the BruxZir shaded formulation, there is no compromise in regards to the esthetics. BruxZir restorations exhibit improved translucency and colour similar to natural dentition. Designed and milled using cad/cam technology. BruxZir solid zirconia is sintered for 2 hours at 1530 degree Celsius to achieve optimum strength. The final BruxZir restorations emerge nearly bulletproof and then glazed to a smooth surface. Click this link and watch the video how BruxZir crown and bridges are made at our dental lab with CAD-Cam technology and hammer test, why BruxZir is called virtually unbreakable with 15 years warranty.